Rashmi Bansal is a writer, entrepreneur and a youth expert. She is the author of seven bestselling books on entrepreneurship including Stay Hungry Stay Foolish, Connect the Dots and Take Me Home, which have sold more than 1 million copies and been translated into ten languages. Her book Follow Every Rainbow features women entrepreneurs who have raised both a family and business. She classifies these women into ‘Laxmis’, ‘Durgas’ and ‘Saraswatis’, bringing a uniquely Indian cultural context to the issue of women and leadership. 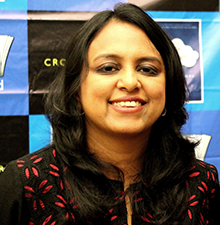 Rashmi is also the founder of bloodygoodbook.com, a platform to discover and e-publish budding authors. Earlier in her career, she was the founder-editor of JAM (Just Another Magazine), which went on to become India’s most popular youth magazine. Her popular blog Youthcurry features her writings on youth, careers and entrepreneurship. Rashmi is a regular contributor to Businessworld and Business Today magazine. She has also been Consulting Editor with business news channel Bloomberg UTV where she hosted India’s first call-in show on careers ‘Stay Hungry’. Rashmi mentors numerous students and young entrepreneurs and has spoken at various corporates and institutes of national and international repute namely, IIM Ahmedabad, ISB Hyderabad and Kellogg School of Management. Rashmi is an Economics graduate from Sophia College, Mumbai and an MBA from IIM Ahmedabad.